From the moment you meet Marena Pearson, a Certified Nursing Assistant (CNA) at our Wesley Woods home, you know she’s not one to seek the spotlight. Marena has been CNA at A.G. Rhodes’ Wesley Woods home since it opened in 1997. 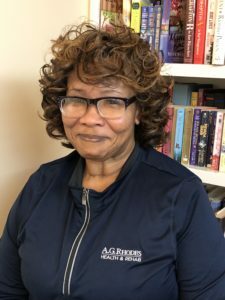 Prior to that, she worked at the Wesley Woods Health Center and moved over to A.G. Rhodes to help open it along with several other employees from the Center. A native of Alabama, Marena has been in the long-term care industry for more than 40 years. “The job involves caring for residents, picking up on their needs, and trying to help with whatever I can,” said Marena. From a young age, Marena was interested in taking care of others. Marena recognizes that it’s not an easy job, but said that it’s more than just work—it’s an important service. “Don’t be there just for the paycheck,” she said. Marena said that when things get challenging, what keeps her going is that she relies on her coworkers—they are all a team. “I refer back to the nurses on the unit,” she said. When offering advice for the next generation of caregivers, Marena said you have to really care to do this job, and that it’s important to see things from the residents’ perspective. “Look at where the residents are, because at any time it could be you,” she said. In Marena’s leisure time, she likes to watch TV—especially mystery shows—and read books.